The new year has arrived and with it I am starting a new challenge. This year my goal is to read 110 books that are new to me and 200 books over all. I finished out my 100 in 2012 challenge at 113 books, so I should make it easily. I didn’t actually track re-reads last year so I don’t know what my actual total was. The train trip up to PA allowed me to get a major jump-start on that goal. 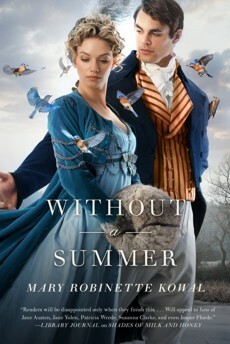 My very first book of 2013 was Without a Summer by Mary Robinette Kowal. This is the third book in her regency fantasy series. It will be coming out in April from Tor. I highly recommend the series. I reviewed the first book, Shades of Milk & Honey earlier in this blog. Jane and Vincent go to London to work on a commission. Jane takes her younger sister in the hopes of finding her a husband. I love all three books in this series, but I especially like this one. Jane makes mistakes and jumps to conclusions in this book. She is entirely human and real and I feel like I know her. Not just because I’ve now spent three books with her, but because I have seen her failures and her triumphs. Mary Robinette Kowal does an excellent job weaving the history and politics of the time into her stories. Mount Tambora erupted in 1815 leading to global cooling. In the glamuralist world Mary has built there are glamorists who can call forth cool breezes and on cold enough days, actually create ice. These magicians are being blamed for the cold weather and crop failures. She masterfully links the plight of the coldmongers with that of the weavers who are being displaced by automated weaving frames. Jane and Vincent get caught up in a tangle between the cold mongers, Vincent’s father, and the army that has been called out to suppress any rebellion. The next book I read was The Rithmatist by Brandon Sanderson. This one will be out in May from Macmillan. It’s a fantastic YA about a world where some people can bring their drawings to life. The Rithmatists are able to sketch wards and protections against the wild chalklings that threaten the country. Joel is a 16-year old student who wants more than anything to be a rithmatist, but he was not chosen. He has to be content with sneaking into classes when possible and reading the books on rithmatics that he can sneak out of the library. Joel’s entire world is turned upside down when students start disappearing and all the evidence points to a rithmatist as the culprit. What can a regular boy do against a rogue magician? Joel will have to gather his courage and find out before more of his classmates are lost. My third book of the year was John Scalzi’s Old Man’s War. I read this for the Sword & Laser book club this month. It is a really cool story. In the future you can join the Colonial Defense Force when you’re 75. They get you back into fighting shape and send you off to fight aliens. No one is allowed to come back to Earth so none of the new recruits know exactly what happens. One of the things I like most about this book is that when you take away the external trappings it’s a very personal story about a man going to war after he loses the woman he loves. Granted, he’s 75, she died of a stroke, and the war is in space, but it’s still a very intimate narrative. It reminded me of Starship Troopers, but has less of a political message. I’m ordering the next book in the series and I’ll let you know how it goes. The last book I’ve read this week is actually a re-read of Touched by an Alien by Gini Koch. I first encountered Gini at LepreCon in Phoenix, at the same time I met Kevin Hearne. She was a hoot so I picked up the first book in her Aliens series. It’s fantastic. It’s on the romance side of things, but with a really great sense of humor. Kitty is leaving jury duty when a perfectly normal traffic accident becomes something out of Men in Black. The man involved in the accident suddenly turns into a monster with razor-sharp wings. Kitty does the only logical thing and stabs him with a Mont Blanc pen out of her purse of many wonders. Before she knows it the news is hailing her as a hero for taking out a terrorist and several very attractive men in black Armani are hustling her away to a secret lab. It turns out that aliens are here on planet Earth and only some of them want to kill us, the others want to protect us and look damn hot while doing it. I’m now listening to Trapped by Kevin Hearne and reading Mr. Penumbra’s 24-Hour Book Store. I’ll keep you posted on those! The Rithmatist looks amazing. Have you read Mistborn by Sanderson? I loved that. I’ve been meaning to read the other books in the series. I haven’t read anything else by him except Legion, which was free on Audible. I’ve got a copy of Warbreaker that I’m planning to start soon.